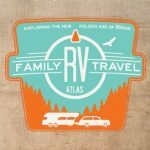 When prepping for an RV trip, we spend a lot of time dreaming about the destination, booking the perfect campgrounds, and packing all the gear we’ll need for an epic trip. Unfortunately, safe RVing is not something that immediately comes to mind in the excitement of travel planning. Luckily, these ten tips will make it easy for you to hit the road with safety in mind. Keep a sticky note on your dash showing the height and width of your rig. When you’re rolling down the highway headed for a low overpass, you don’t want to be scrambling to remember the exact height of your rig. Dozens of embarrassing photos can be found online of RVs stuck under overpasses, some with their roofs peeled off. Don’t be that person. On every single travel day, you must check your tire pressure while the tires are cold. Visually inspect your tires for warps and cracks. Tire blowouts can be very dangerous, but many can be avoided with proper maintenance. Also, remember to replace RV tires based on their age instead of their mileage. If you are headed out for a long journey, you might find yourself saying, “I’ll take this just in case I need it.” Don’t! Carrying too much cargo puts you at risk of overloading your trailer weight. Every rig has a yellow sticker that lists the limits of the cargo weight. When in doubt, take your RV to a weigh station to check. Overloading and improper weight balances can cause swerving and fishtailing on the road. Some RVers make the mistake of driving or towing their RVs like they drive their cars, but you shouldn’t. Pushing the speed limit in a heavy rig is much more dangerous because the weight of your RV makes it harder to come to a complete stop. Think more about how fast you can stop rather than how fast you can go. Before hitting the road, hit the checklist! This list should detail maintenance and safety items you want to accomplish on every driving day and before every trip. It’s easy to forget important items if you don’t write them down. Many campers focus their attentions on their RV before heading out on a trip; however, the tow (and towed) vehicles must also be checked. The vehicle pulling your trailer plays a major role in your journey. Breakdowns on the road are not only expensive, they can be dangerous. Get a mechanical inspection and fresh oil change, and check the tires and fluid levels. If you are towing a vehicle behind a motorhome, it should also have a pre-trip inspection to keep it from being a liability. Well-stocked toolkits and first aid kits ensure you can take care of the simple repairs and health issues that arise while on the road. Having the right tools to work on your vehicle and/or RV can prevent you from spending hours on the side of the road. Similarly, first aid kits allow you to deal with minor emergencies without locating a medical facility. Stock bandages, antibiotic ointment, and a variety of medications. Sitting on the side of the road is no fun for anyone, and it is especially stressful when you are several states away from home. A roadside assistance service can ensure you get the help you need, no matter where you are. Select your routes with safety in mind. There are some roads RVs just don’t belong on. While scenic routes offer the best views, you may not find ideal road conditions. Some roads may pitch like a roller coaster or be lined with ditches instead of shoulders. Furthermore, finding a gas station with easy access can be difficult the further you get from the interstate. Use a truck-driving atlas to find the best routes for a big rig. Weather conditions can hamper the fun—and safety—of any trip, so it is important to keep an eye on the skies. Use a weather app that emits alerts based on your location. These can alert you to thunderstorms, tornadoes, snowstorms, and more. Also, be mindful of which county you are in and which cities are nearby since these landmarks are used in weather alerts. No one wants to worry about safety, but the failure to do so can upend your whole journey. Taking the time to focus on safety can prevent you from having emergencies and dangerous situations that hamper your fun. With these ten tips in mind, you’ll be on your way to safer RVing.